Ripe, red cherries, bursting with juice that stains mouths and fingers, are in the market for just a few summer months. Though other fruits can be frozen, canned, or preserved with equanimity, cherries belong to the class of fruit whose heady flavor wilts in captivity. Use sweet, juicy Bings to their best advantage this summer in treats like a tart or a refreshing drink, or in a quick jam. 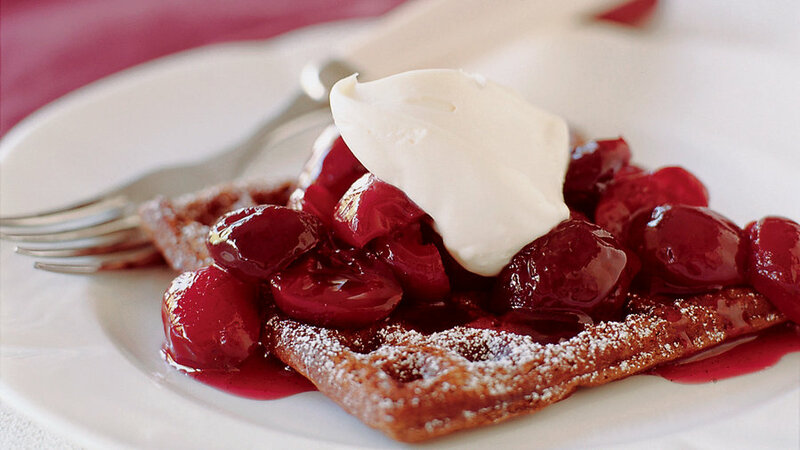 A cherry pitter is an invaluable tool if you’re cooking with fresh cherries and an indispensable one if you want the cherries to remain whole. Cherry pitters retail for $10 to $15 at kitchen-supply stores; here’s how to use one. Work over a bowl to catch the pits and juice, minimizing mess. Have another bowl handy for the pitted fruit. Hold a stemmed cherry immobile in the pitter, stem side toward the rod. Press down on the lever. The pointed rod will push through the center of the cherry, and the pit will shoot out the bottom. The juice may spatter, so wear an apron.